The saying, Tenuki is always an option, (proposed by Bill Spight), serves as a beginner advice to counter the bad habit of following the opponent around, but it does not just apply to beginners. Even dan players can fail to tenuki. In an effort to break some mid-kyu pupils of the habit of always answering their opponent's moves, Janice Kim told them to try playing tenuki on every move! It's surprising how long you can keep this up and how mind-opening it is. 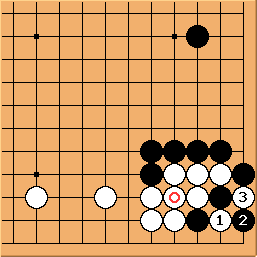 Bill: Here is a tenuki example of a large yose, so large, in fact, that it might be played in the early middle game. It is problem 48 in the latest edition of the Small Yose Dictionary?, published by the Nihon Kiin. Black has a nice tesuji here. White protects the corner. Later - is sente. 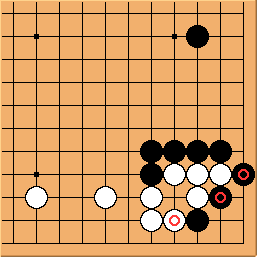 Black takes away the corner, leaving White with a dumpling. What is your feeling about ? Should Black play tenuki or not? 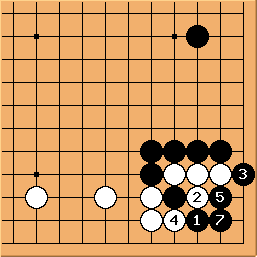 Every yose book that I have seen that shows this tesuji has Black connect. 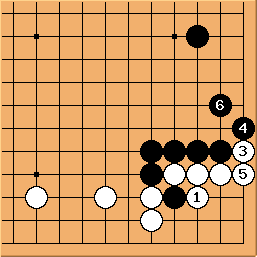 Connecting is right locally, of course, but in fact the local temperature has dropped, and Black should probably play tenuki. In a real game, I expect that pros will tenuki when it is right to do so. But for some reason that does not get into the books, and amateurs who read those books may be misled. How can you tell that the local temperature has dropped and that it is tenuki time? You could estimate the size of the plays, but there is an easier way. Suppose that Black plays tenuki after White 6 and that White later plays at 7. White 1 reclaims the corner. Later - is sente. I hope that by this time you are suspicious of . 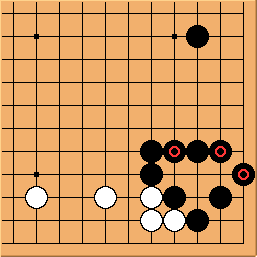 If Black is going to play tenuki after , maybe it's not such a hot play, either. Indeed, that is the case. Here it may not be so obvious that the local temperature has dropped, but the marked stones show that both sides have made incursions into the corner, shrinking the size of what is at stake. Besides, who wants to make an ugly dumpling? Some tewari analysis. Suppose that Black takes White's four stones. 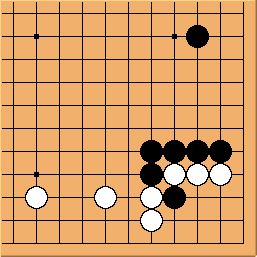 Then White will have lost three stones more than Black in the corner. If we match those stones with the three marked Black stones, we see that losing those stones is hardly a tragedy for White (even though Black's outer stones are working). See When in doubt, tenuki, for the actual proverb. Bill: I came up with that as a kind of joke, many years ago. The actual proverb is a bit more subtle. If Black is komaster he can make this ko. 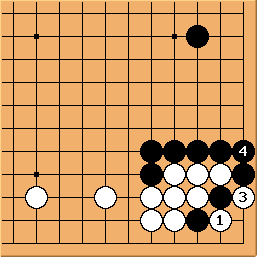 However, the result is to make (and Black's connection there) and White's previous connection (marked) worth a little bit less, while it makes the original play worth a little bit more. Tenuki is still normal in both cases.